By now, you've had a chance to see the pic I posted before. That sweet little girl is my friend's niece, Sienna. She is 3 years old and has stage 4 neuroblastoma. Across the country (and in places around the world) people are doing what they can to help raise money for little Sienna. Celebrities are also doing their part! 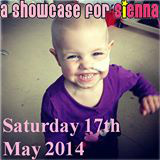 I'm taking this opportunity to do the same, I urge you, please follow Sienna's Journey on Facebook, on Twitter. Please donate anything that you can to help this gorgeous little girl fight the cancer that is making her so poorly.